A coral reef is made up of millions of tiny animals called polyps. They are found in clear, tropical seas where the water is warm and there is a lot of sunlight. The Great Barrier Reef near Australia is the world's largest coral reef. 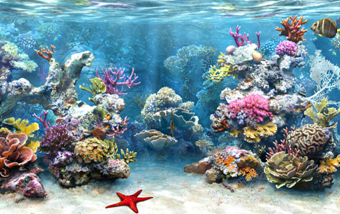 People like diving to look at coral reefs because they are so beautiful and colourful. Turtles and clown fish like living on them too. Many countries are trying to stop coral reefs from being damaged by dirty water or being hit by ships.